Sound waves, characterized by frequency and amplitude, are perceived uniquely by different organisms. Sound waves are mechanical pressure waves that must travel through a medium and cannot exist in a vacuum. There are four main characteristics of a sound wave: frequency, wavelength, period, and amplitude. Frequency is the number of waves per unit of time and is heard as pitch; high-frequency sounds are high-pitched, and low-frequency sounds are low-pitched. Most humans can perceive sounds with frequencies between 30 and 20,000 Hz; other animals, such as dolphins, can detect sounds at far higher frequencies. Amplitude, the dimension of a wave from peak to trough, is heard as volume; louder sounds have greater amplitudes than those of softer sounds. Auditory stimuli are sound waves, which are mechanical pressure waves that move through a medium, such as air or water. There are no sound waves in a vacuum since there are no air molecules for the waves to move through. The speed of sound waves differs based on altitude, temperature, and medium. At sea level and a temperature of 20º C (68º F), sound waves travel in the air at about 343 meters per second. 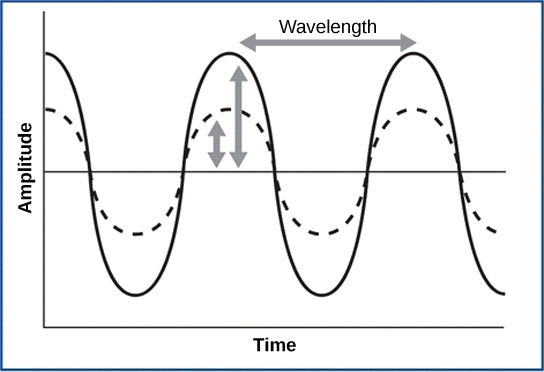 As is true for all waves, there are four main characteristics of a sound wave: frequency, wavelength, period, and amplitude. Frequency is the number of waves per unit of time; in sound, it is heard as pitch. High-frequency (≥15.000Hz) sounds are higher-pitched (short wavelength) than low-frequency (long wavelengths; ≤100Hz) sounds. Frequency is measured in cycles per second. For sound, the most-commonly used unit is hertz (Hz), or cycles per second. Most humans can perceive sounds with frequencies between 30 and 20,000 Hz. Women are typically better at hearing high frequencies, but everyone’s ability to hear high frequencies decreases with age. Dogs detect up to about 40,000 Hz; cats, 60,000 Hz; bats, 100,000 Hz; dolphins, 150,000 Hz; and the American shad (Alosa sapidissima), a fish, can hear 180,000 Hz. Those frequencies above the human range are called ultrasound. Amplitude, or the dimension of a wave from peak to trough, in sound is heard as volume. The sound waves of louder sounds have greater amplitude than those of softer sounds. For sound, volume is measured in decibels (dB). The softest sound that a human can hear is the zero point. Humans speak normally at 60 decibels. Amplitude: For sound waves, wavelength corresponds to pitch. The amplitude of the wave corresponds to volume. The sound wave shown with a dashed line is softer in volume than the sound wave shown with a solid line.